Scholars and the Angel of Death. In the Bible death is viewed under form of an angel sent from God, a being deprived of all voluntary power. The "angel of the Lord" smites 185,000 men in the Assyrian camp (II Kings xix. 35). "The destroyer" ("ha-mashḥit") kills the first-born of the Egyptians (Ex. xii. 23), and the "destroying angel" ("mal'ak ha-mashḥit") rages among the people in Jerusalem (II Sam. xxiv. 15). In I Chron. xxi. 15 the "angel of the Lord" is seen by David standing "between the earth and the heaven, having a drawn sword in his hand stretched out over Jerusalem." Job (xxxiii. 22) uses the general term "destroyer" ("memitim"), which tradition has identified with "destroying angels" ("mal'ake ḥabbalah") (Bacher, "Ag. Pal. Amor." iii. 279, note 9), and Prov. xvi. 14 uses the term the "angels of death" ("mal'ake ha-mawet"). See Demonology. The Rabbis found the angel of death mentioned in Ps. lxxxix. 45 (A. V. 48), where the Targum translates: "There is no man who lives and, seeing the angel of death, can deliver his soul from his hand" (compare also Targ. to Job xviii. 13; Ps. xci. 5; Hab. iii. 5). Eccl. viii. 4 is thus explained in Midr. R. to the passage: "One may not escape the angel of death, nor say to him, 'Wait until I put my affairs in order,' or 'There is my son, my slave: take him in my stead.'" 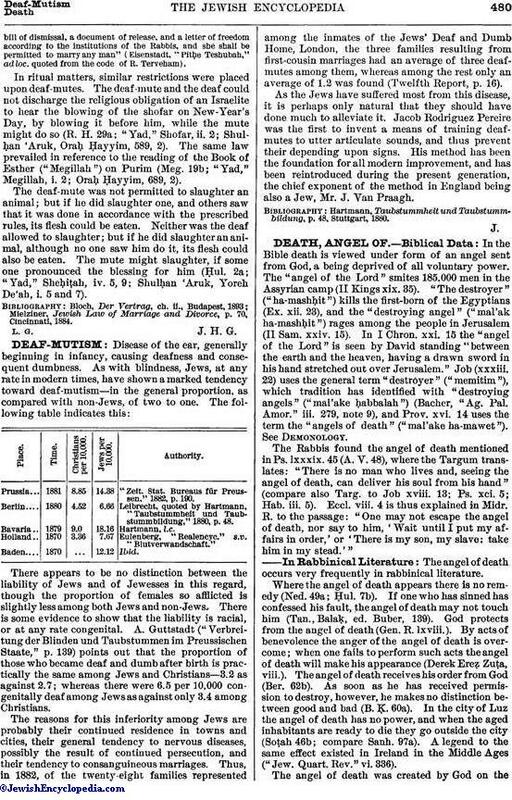 The angel of death occurs very frequently in rabbinical literature. Where the angel of death appears there is no remedy (Ned. 49a; Ḥul. 7b). If one who has sinned has confessed his fault, the angel of death may not touch him (Tan., Balaḳ, ed. Buber, 139). God protects from the angel of death (Gen. R. lxviii.). By acts of benevolence the anger of the angel of death is overcome; when one fails to perform such acts the angel of death will make his appearance (Derek Ereẓ Zuṭa, viii.). The angel of death receives his order from God (Ber. 62b). As soon as he has received permission to destroy, however, he makes no distinction between good and bad (B. Ḳ. 60a). In the city of Luz the angel of death has no power, and when the aged inhabitants are ready to die they go outside the city (Soṭah 46b; compare Sanh. 97a). A legend to the same effect existed in Ireland in the Middle Ages ("Jew. Quart. Rev." vi. 336). The angel of death was created by God on thefirst day (Tan. on Gen. xxxix. 1). His dwelling is in heaven, whence he reaches earth in eight flights, whereas pestilence reaches it in one (Ber. 4b). He has twelve wings (Pirḳe R. El. xiii). "Over all people have I surrendered thee the power," said God to the angel of death, "only not over this one which has received freedom from death through the Law" (Tan. to Ex. xxxi. 18; ed. Stettin, p. 315). It is said of the angel of death that he is full of eyes. In the hour of death he stands at the head of the departing one with a drawn sword, to which clings a drop of gall. As soon as the dying man sees the angel, he is seized with a convulsion and opens his mouth, whereupon the angel throws the drop into it. This drop causes his death; he turns putrid, and his face becomes yellow ('Ab. Zarah 20b; in detail, Jellinck, "B. H." i. 150; on putrefaction see also Pesiḳ. 54b; for the eyes compare Ezek. i. 18 and Rev. iv. 6). The expression "to taste of death" originated in the idea that death was caused by a drop of gall ("Jew. Quart. Rev." vi. 327; see Death, Views of). The soul escapes through the mouth, or, as is stated in another place, through the throat; therefore the angel of death stands at the head of the patient (Jellinek, l.c. ii. 94, Midr.Teh. to Ps. xi.). When the soul forsakes the body its voice goes from one end of the world to the other, but is not heard (Gen. R. vi. 7; Ex. R. v. 9; Pirḳe R. El. xxxiv.). The drawn sword of the angel of death, mentioned by the Chronicler (I. Chron. xxi. 15; comp. Job xv. 22; Enoch lxii. 11), indicates that the angel of death was figured as a warrior who kills off the children of men. "Man, on the day of his death, falls down before the angel of death like a beast before the slaughterer" (Grünhut, "Liḳḳuṭim," v. 102a). R. Samuel's father (c. 200) said: "The angel of death said to me, 'Only for the sake of the honor of mankind do I not tear off their necks as is done to slaughtered beasts'" ('Ab. Zarah 20b). In later representations the knife sometimes replaces the sword, and reference is also made to the cord of the angel of death, which indicates death by throttling. Moses says to God: "I fear the cord of the angel of death" (Grünhut, l.c. v. 103a et seq.). Of the four Jewish methods of execution three are named in connection with the angel of death: burning (by pouring hot lead = the drop of gall), slaughtering (by beheading), and throttling. The angel of death administers the particular punishment which God has ordained for the commission of sin. A peculiar mantle ("idra"—according to Levy, "Neuhebr. Wörterb." i. 32, a sword) belongs to the equipment of the angel of death (Eccl. R. iv. 7). The angel of death takes on the particular form which will best serve his purpose; e.g., he appears to a scholar in the form of a beggar imploring pity (M. Ḳ. 28a). "When pestilence rages in the town, walk not in the middle of the street, because the angel of death [i.e., pestilence] strides there; if peace reigns in the town, walk not on the edges of the road. When pestilence rages in the town, go not alone to the synagogue, because there the angel of death stores his tools. If the dogs howl, the angel of death has entered the city; if they make sport, the prophet Elijah has come" (B. Ḳ. 60b). The "destroyer" ("saṭan ha-mashḥit") in the daily prayer is the angel of death (Ber. 16b). Midr. Ma'ase Torah (compare Jellinek, "B. H." ii. 98) says: "There are six angels of death: Gabriel over kings; Ḳapẓiel over youths; Mashbir over animals; Mashḥit over children; Af and Ḥemah over man and beast." When the Messiah comes all the dead will arise, and there will be an end to death; for the angel of death himself will be destroyed by the Messiah (Pesiḳ. R., ed. Friedmann, p. 161b). Satan, as the angel of death, is identified here with Antichrist. "The last enemy that shall be destroyed is death" (I Cor. xv. 26; compare Heb. ii. 14). The same idea seems to be expressed in the Book of Jubilees xxiii. 29: "And they shall fulfil all their days in peace and joy, and shall live on, since there will be no Satan and no evil to destroy them." The angel of death, who is identified with Satan, immediately after his creation had a dispute with God as to the light of the Messiah (Pesiḳ. R. 161b). When Eve touched the tree of knowledge, she perceived the angel of death, and thought: "Now I shall die, and God will create another wife for Adam" (Pirḳe R. El. xiii., end; compare Targum Yer. to Gen. iii. 6, and Yalḳ. i. § 25). Adam also had a conversation with the angel of death (Böklen, "Die Verwandtschaft der Jüdisch-Christlichen mit der Parsischen Eschatologie," p. 12). The angel of death sits before the face of the dead (Jellinek, l.c. ii. 94). While Abraham was mourning for Sarah the angel appeared to him, which explains why "Abraham stood up from before his dead" (Gen. xxiii. 3; Gen. R. lviii. 5, misunderstood by the commentators). Samuel told Sarah that Abraham had sacrificed Isaac in spite of his wailing, and Sarah died of horror and grief (Pirḳe R. El. xxxii.). It was Moses who most often had dealings with the angel. At the rebellion of Korah, Moses saw him (Num. R. v. 7; Bacher, l.c. iii. 333; compare Sanh. 82a). It was the angel of death in the form of pestilence which snatched away 15,000 every year during the wandering in the wilderness (ib. 70). When Moses reached heaven, the angel told him something (Jellinek, l.c. i. 61). When the angel of death came to Moses and said, "Give me thy soul," Moses called to him: "Where I sit thou hast no right to stand." And the angel retired ashamed, and reported the occurrence to God. Again, God commanded him to bring the soul of Moses. The angel went, and, not finding him, inquired of the sea, of the mountains, and of the valleys; but they knew nothing of him (Sifre, Deut. 305). Really, Moses did not die through the angel of death, but through God's kiss ("bi-neshiḳah"); i.e., God drew his soul out of his body (B. B. 17a; compare Abraham in Apocryphal and Rabbinical Literature, and parallel references in Böklen, l.c. p. 11). 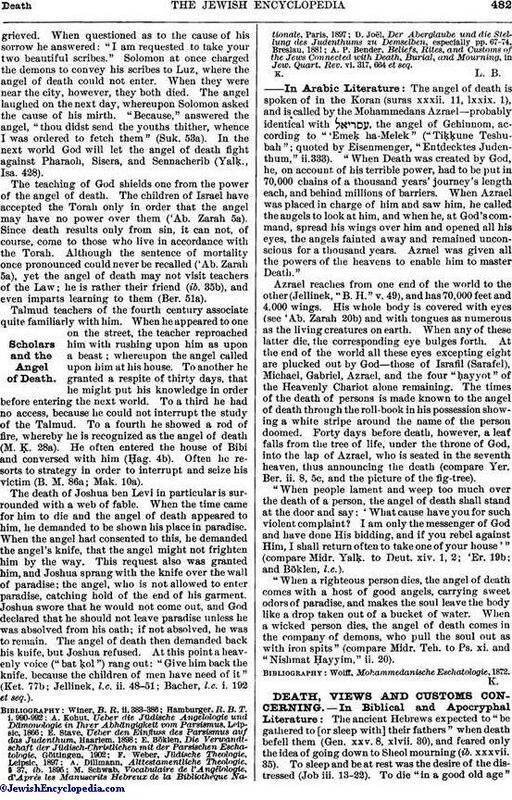 Legend seizes upon the story of Moses' struggle with the angel of death, and expands it at length (Tan., ed. Stettin, pp. 624 et seq. ; Deut. R. ix., xi. ; Grünhut, l.c. v. 102b, 169a). As Benaiah bound Ashmedai (Jew. Encyc. ii. 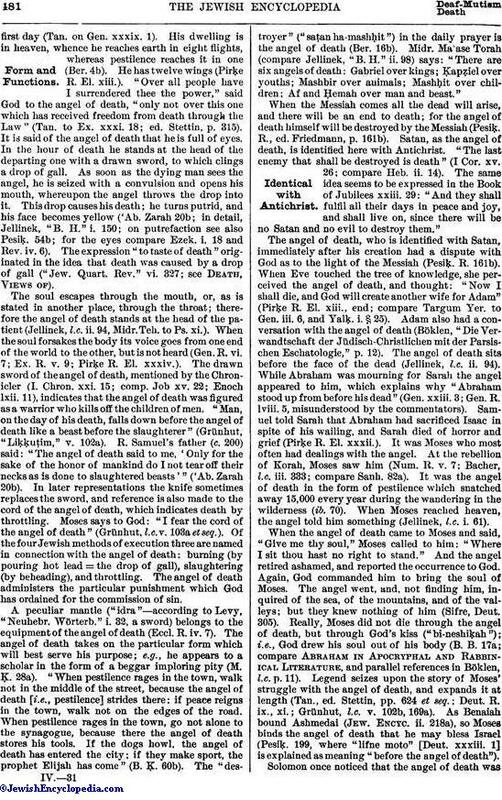 218a), so Moses binds the angel of death that he may bless Israel (Pesiḳ. 199, where "lifne moto" [Deut. xxxiii. 1] is explained as meaning "before the angel of death"). Solomon once noticed that the angel of death wasgrieved. When questioned as to the cause of his sorrow he answered: "I am requested to take your two beautiful scribes." Solomon at once charged the demons to convey his scribes to Luz, where the angel of death could not enter. When they were near the city, however, they both died. The angel laughed on the next day, whereupon Solomon asked the cause of his mirth. "Because," answered the angel, "thou didst send the youths thither, whence I was ordered to fetch them" (Suk. 53a). In the next world God will let the angel of death fight against Pharaoh, Sisera, and Sennacherib (Yalḳ., Isa. 428). The teaching of God shields one from the power of the angel of death. The children of Israel have accepted the Torah only in order that the angel may have no power over them ('Ab. Zarah 5a). Since death results only from sin, it can not, of course, come to those who live in accordance with the Torah. Although the sentence of mortality once pronounced could never be recalled ('Ab. Zarah 5a), yet the angel of death may not visit teachers of the Law; he is rather their friend (ib. 35b), and even imparts learning to them (Ber. 51a). Talmud teachers of the fourth century associate quite familiarly with him. When he appeared to one on the street, the teacher reproached him with rushing upon him as upon a beast; whereupon the angel called upon him at his house. To another he granted a respite of thirty days, that he might put his knowledge in order before entering the next world. To a third he had no access, because he could not interrupt the study of the Talmud. To a fourth he showed a rod of fire, whereby he is recognized as the angel of death (M. K. 28a). He often entered the house of Bibi and conversed with him (Ḥag. 4b). Often he resorts to strategy in order to interrupt and seize his victim (B. M. 86a; Mak. 10a). The death of Joshua ben Levi in particular is surrounded with a web of fable. When the time came for him to die and the angel of death appeared to him, he demanded to be shown his place in paradise. When the angel had consented to this, he demanded the angel's knife, that the angel might not frighten him by the way. This request also was granted him, and Joshua sprang with the knife over the wall of paradise; the angel, who is not allowed to enter paradise, catching hold of the end of his garment. Joshua swore that he would not come out, and God declared that he should not leave paradise unless he was absolved from his oath; if not absolved, he was to remain. The angel of death then demanded back his knife, but Joshua refused. At this point a heavenly voice ("bat ḳol") rang out: "Give him back the knife, because the children of men have need of it" (Ket. 77b; Jellinek, l.c. ii. 48-51; Bacher, l.c. i. 192 et seq.). A. P. Bender, Beliefs, Rites, and Customs of the Jews Connected with Death, Burial, and Mourning, in Jew. Quart. Rev. vi. 317, 664 et seq. The angel of death is spoken of in the Koran (suras xxxii. 11, lxxix. 1), and is called by the Mohammedans Azrael—probably identical with , the angel of Gehinnom, according to "'Emeḳ ha-Melek" ("Tiḳḳune Teshubah"; quoted by Eisenmenger, "Entdecktes Judenthum," ii.333). "When Death was created by God, he, on account of his terrible power, had to be put in 70,000 chains of a thousand years' journey's length each, and behind millions of barriers. When Azrael was placed in charge of him and saw him, he called the angels to look at him, and when he, at God's command, spread his wings over him and opened all his eyes, the angels fainted away and remained unconscious for a thousand years. Azrael was given all the powers of the heavens to enable him to master Death." Azrael reaches from one end of the world to the other (Jellinek, "B. H." v. 49), and has 70,000 feet and 4,000 wings. His whole body is covered with eyes (see 'Ab. Zarah 20b) and with tongues as numerous as the living creatures on earth. When any of these latter die, the corresponding eye bulges forth. At the end of the world all these eyes excepting eight are plucked out by God--those of Israfil (Sarafel), Michael, Gabriel, Azrael, and the four "ḥayyot" of the Heavenly Chariot alone remaining. The times of the death of persons is made known to the angel of death through the roll-book in his possession showing a white stripe around the name of the person doomed. Forty days before death, however, a leaf falls from the tree of life, under the throne of God, into the lap of Azrael, who is seated in the seventh heaven, thus announcing the death (compare Yer. Ber. ii. 8, 5c, and the picture of the fig-tree). "When people lament and weep too much over the death of a person, the angel of death shall stand at the door and say: 'What cause have you for such violent complaint? I am only the messenger of God and have done His bidding, and if you rebel against Him, I shall return often to take one of your house'" (compare Midr. Yalḳ. to Deut. xiv. 1, 2; 'Er. 19b; and Böklen, l.c.). "When a righteous person dies, the angel of death comes with a host of good angels, carrying sweet odors of paradise, and makes the soul leave the body like a drop taken out of a bucket of water. When a wicked person dies, the angel of death comes in the company of demons, who pull the soul out as with iron spits" (compare Midr. Teh. to Ps. xi. and "Nishmat Ḥayyim," ii. 20).